I’m not in the market for a Jeep pickup unless it’s a rusty Forward Control for under $1,000. 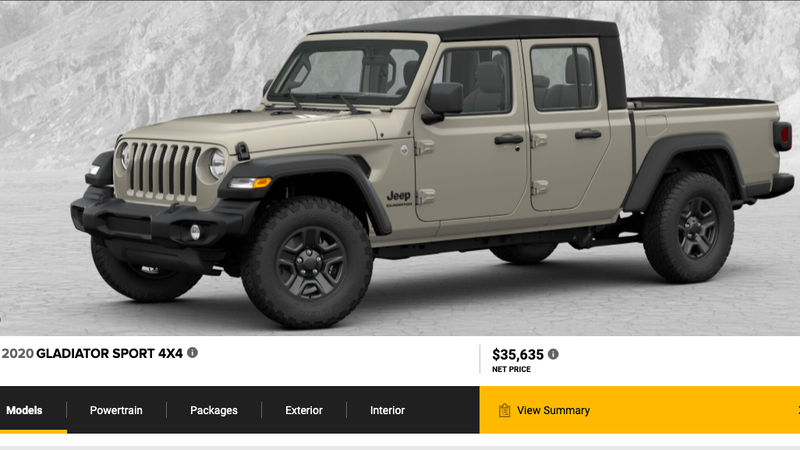 Still, the 2020 Jeep Gladiator’s “Build & Price” website tool is up, so now I can show you—based on my short test drive—which Gladiator I would buy. I’m a big fan of the Gladiator in base Sport trim. It comes standard with a good six-speed manual trans to manage the 285 horsepower V6, standard four-wheel drive with low-range, 3.73 Dana 44 solid axles, 32-inch all-season tires, steel wheels, crank-down windows, manual locks, a tiny infotainment screen, a couple of USB ports, a damped tailgate, push-button start, some lockable behind-seat storage, and not a whole lot else. It’s a spartan machine, and the only option box I’d tick is the “Trac-Lok Anti-Spin Rear Differential,” which helps with off-road traction, only costs $595, and includes a switch to all-terrain tires. I’d definitely hop onto Craigslist and look for a set of JL Wrangler take-off aluminum wheels (preferably with all-terrain tires on them) to replace the black steelies, and at some point, I’d try to get some rock rails to cover those pinch seams on the rocker panels, but otherwise I’d leave the soft-top $35,635 Jeep Gladiator Sport as-is. Feel free to check out the Jeep Gladiator’s Build & Price tool here, and show us how you’d configure your convertible Jeep pickup.